Okay. Now I'm gonna cry. Love it! I actually had a nest full of babies in one of my huge potted plants. I kinda felt like a mom always checking in on them! Now they're gone and I'm a little sad. Ah the circle of life in photo! I hope they moved out on their own, not as passengers in some larger animals stomach. Ahhhh the babies are gone! That's actually kinda sad. Um, yeah, I'm with Badass. I truly hope they had a wonderful flight into the sky. 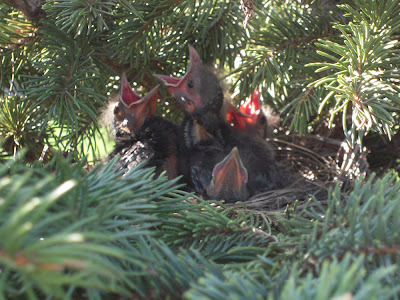 The horrors I've witnessed with my baby birds over the years have me scarred for life and not all too happy about the four nests we have going out back right now. I get too attached. 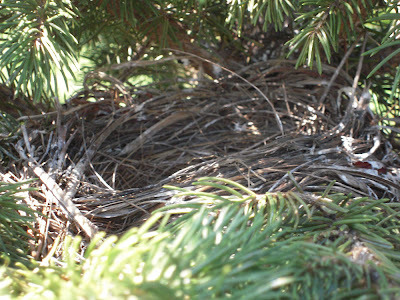 Empty nests are always a little sad. How much time between pics? Awwww, I hope nothing happened to them. What dear little things!